I read Redwall this year because of the aforementioned Facebook challenge wherein I invited six people to recommend a title for me to read, promising to read whatever they suggested. 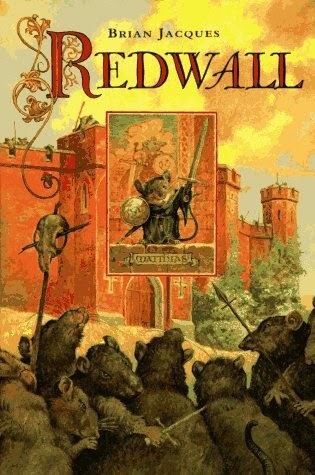 Stephanie from Simple Things put forth Redwall as her title of choice thereby ensuring that it would be read this year. Indeed, it has been done. This first title in the Redwall series by Brian Jacques was first published in 1986, although it was written many years prior to that. Jacques wrote the story of Redwall for the children at the Royal Wavertree School for the Blind in Liverpool. He worked as a truck driver, who delivered milk to the school, when he decided to write a beautifully descriptive story to entertain the children there. Eventually, he showed his story to his former English teacher who read it, loved it, and submitted it to a publisher without Jacques' knowledge. Now his stories are available to entertain the world. Yes, I was entertained by this story about the mice of Redwall. I was entertained and encouraged, but more on the latter in a moment. First, it was entertaining meeting this group of woodland creatures who live in and around Redwall Abbey. It was exciting to watch them band together - with all of their strengths and weaknesses - to defend the Abbey and the surrounding countryside from an evil foe. This world that Jacques created in Redwall is under attack from a hideous villain, Cluny the Scourge. Cluny is a horrid evil rat who is eager to claim the Abbey as his own, no matter the cost. The story is full of adventure, heartache and the glory of ultimate victory. This book contains some mighty fine story telling, that is for sure. I really loved this story for the bold adventure which it is. Jacques rallies his woodland characters to rise to a difficult occasion. An evil enemy who lacks mercy or a conscience is among them. Cluny's mission in life is to seek, kill and destroy. He doesn't let anyone or anything get in his way. There is truly only one thing that frightens him and that is the story of a legendary mouse warrior who once defended the Abbey from another attack. This same story which causes Cluny to grow weak in the knees has the opposite effect on one young Matthias mouse. Matthias has grown up in the Abbey and is inexperienced at life, let alone heroics. However, when evil comes knocking, Matthias grows in courage and bravery and becomes a true leader of the woodland animals. Redwall Abbey is a peaceful place and the Abbott who is in charge is not interested in waging war at all. However, the Abbott also wisely concludes that war is unavoidable and ultimately decides to trust Matthias with the necessary defense of all that is good and right. Young Matthias shows great bravery and does, in fact, save the Abbey. However, this does not happen without loss of life on both sides following some rather harrowing escapades. This is a messy tale in that Jacques doesn't hold back when describing battle scenes and death. There are blood and guts aplenty. At the same time, it is not gratuitous violence by any stretch of the imagination. The good guys are working hard to defend and protect what is good. The bad guys are out to crush good with evil, just like in real life. As I mentioned earlier, I found this story not only entertaining but also encouraging. Now, Redwall is not a Christian book but I am a Christian reader and I view this book through my own worldview. Just as Matthias rallies his friends to be brave, we Christians also must rally defend truth and do what is right in the face of a great many evils which daily stare us in the face. I loved Redwall because it painted a picture of a war against evil but also did not allow evil to triumph. In fact, evil will never be triumphant in total. It is impossible that that should be. In the battle against good (God) and evil (Satan) the right to the last triumphant word has already been claimed. Satan did not win that. Jesus has won the victory but there are still battles to be fought and is our right and responsibility to fight them. Again, I do not see Redwall as being an analogy of any sort. I simply view it through the eyes of my worldview and that made it quite the exciting and enthralling read. (Although, too, I should be quick to point out that it's an exciting read on its face. My reading "bent" just added an extra layer of meaning for me.) This all explained, I am looking forward to passing this book off to my kids to read. Due to the intense battle scenes, I don't know that I would hand this book over to Bookworm1 (age 8 this month) right away but I don't think he'll need to wait forever to read it. It is good to make sure he's ready for the battle scenes though before he dives on in. Thanks, Stephanie, for causing me to finally pull it down and read it. And thank you, Christopher, for gifting me with it in the first place. I'm sorry for taking so long to get to it! I had never heard of these, but they sound fun. I'll have to keep them in mind for when our little one gets older. Wasn't it good! I'm so glad you liked it. : ) I've only read as far as the first three (which I flew through) so I'm eager to get back to the series - and it's a nice long one that should last me a while. This series has been on my list forever! Do you think it would make a good read-aloud? I think it would make a very exciting read aloud, yes. And then you could edit any parts you think too intense for the kids.